Breakouts. If there’s one word I’ve learned to absolutely resent in life, it’s that word. As someone with sensitive skin, that can and will react to just about anything, I’ve had to learn how to tackle breakouts, naturally. It wasn’t always that way, the natural part. In fact, there was a time, just a few years ago, when my medicine cabinet was filled with every topical breakout treatment available, and my wallet was empty due to the huge expense of such treatments. Now, I cringe when I think about the ingredients many of those treatments were made with, yet, at the time, I trusted them because they were sold in the store. I trusted that they were safe. With each new breakout, I would turn to a new product, because the last product just must have been all wrong for my skin (since nothing ever helped my breakouts). The more I experimented with products, the worse my skin would get, and the cycle of breaking out and purchasing new products would continue. I never once stopped to think that my skin problems may be due to deeper issues, like hormones, stress or gut issues. I also never thought about the damage I might be inflicting on my skin by constantly changing my toxic-at-the-time skincare products and routines. 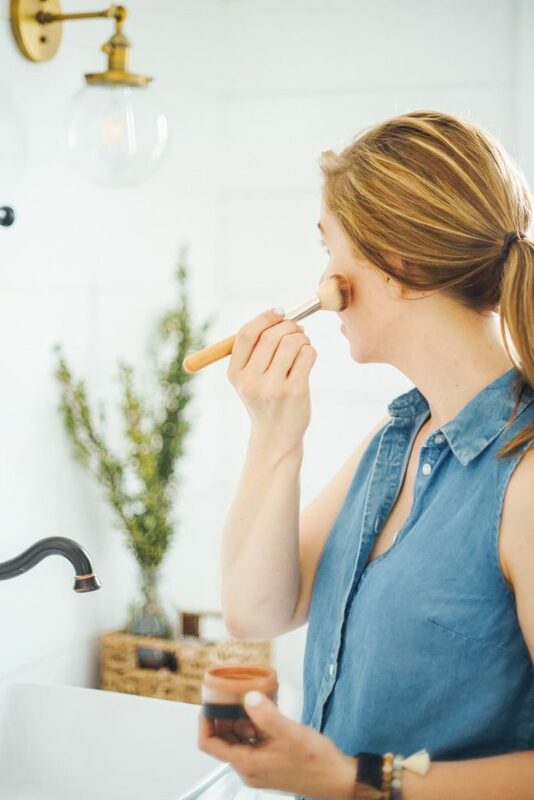 It’s taken me years to find a natural skincare routine that I love, and finally ditch all of my former products. Today, I keep my skincare routine consistent and simple: makeup remover balm, aloe and honey facial cleanser, homemade astringent, and oil moisturizer. That’s it! 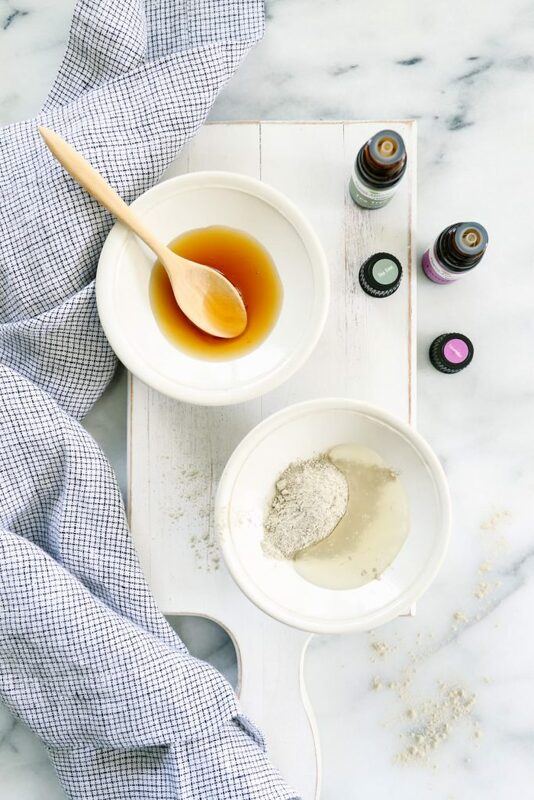 Occasionally, I’ll use a homemade scrub on my skin. Do I need to get more sleep? What about water? Am I drinking enough water? Have I introduced any different foods into my “diet”? Am I under more stress right now? Am I taking care of myself? Am I consuming a fair amount of probiotics? Many times, the breakout answer I’m seeking can be found in one of these questions. Aloe: Aloe vera is a common ingredient used to treat sunburns due to its soothing and antioxidant properties. Since we know aloe is great for the skin, why not add it to a face mask for breakouts? Aloe may also help to reduce scarring, which, of course, can be an issue with breakouts. If you’re interested in some of the benefits of aloe vera for acne, this article is really insightful. Raw Honey: Raw honey is simply honey that hasn’t been pasteurized. Due to the lack of pasteurization (heating), raw honey is naturally rich in antibacterial and probiotic properties. Honey is also gentle on sensitive skin, but tough enough to remove dirt and other impurities. If you can’t find raw honey in your area (although many stores/markets now sell raw honey, so take a look before dismissing this ingredient), pasteurized honey may be used. This article talks more about using honey for acne. Clay: Bentonite clay is made from volcanic ash. The resulting clay is rich in minerals. 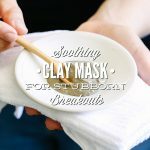 When used externally, the clay may help to clarify the skin, unclog the pores, and reduce inflammation associated with breakouts. 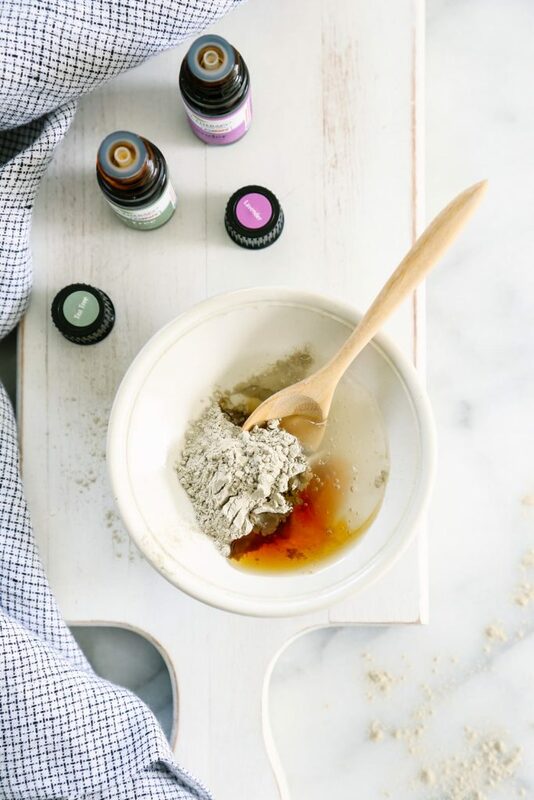 Essential Oils: Two essential oils are added to this mask, lavender and tea tree essential oil, for their soothing and antibacterial properties. Each ingredient comes together to soothe my irritated skin and fight against a stubborn breakout. 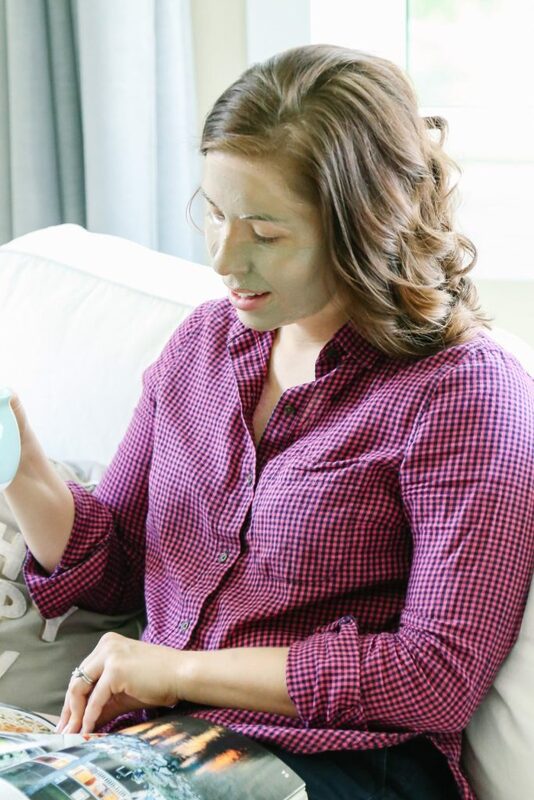 I’ve used this mask as a weekly preventive facial mask (it’s gentle enough on my skin that I can use it two times a week, if needed), as well as a breakout spot treatment for just one area of my face or neck. This mask can be used on a weekly basis, or as an occasional mask for pesky breakouts. Clay is the base ingredient in this mask. I’ve left the clay choice up to you: French green, rhassoul, or bentonite. The mask may be used as a weekly mask, or used as a frequent spot treatment. In a medium-size bowl (you'll want lots of room to stir the ingredients), stir or whisk together the ingredients. 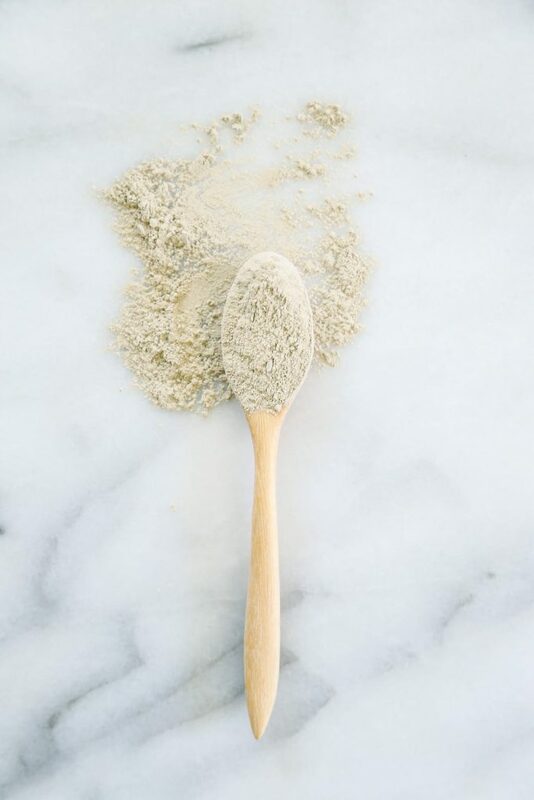 It's important to avoid using metal when working with bentonite clay, so opt for a wooden or plastic spoon or fork. The mask should be wet and a bit lumpy. If the mask is too dry or hard to stir, add a bit more aloe vera gel until you reach the desired consistency. Once a month I like to use a charcoal face mask. The charcoal mask provides a nice skin detox every so often. The charcoal mask is a bit too much to use on a weekly or even bi-weekly basis, at least for me. 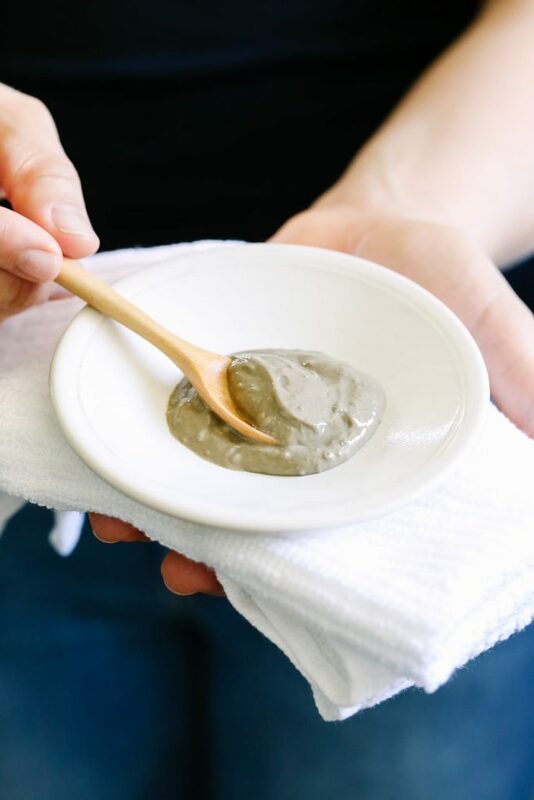 This clay mask is gentle enough to use weekly. When used a spot treatment, for an individual breakout, I like to use this mask once a day. Oh I can’t wait to try! Would french green clay work as well? I already have that on hand. Hey Andrea, Yes, definitely! French green clay should work very well. Do you have a specific brand of the clay that you recommend or will whatever I can find on Amazon work? Can I mix more of this ahead of time (or save leftover) and store in an airtight container for a few days or a week? I never thought I would still be dealing with breakout issues (and newly formed cystic acne issues). I am desperate for something to work and really want to exhaust natural remedies before trying other OTC or prescription meds. Thanks for posting this! Hey Alex, I like the Aztec Healing Clay or Redmond Clay brands. Both have worked well for me. The clay will dry out quickly, so I believe it will only last for a day when stored in an air-tight container. You could try adding more aloe to the recipe to see if that keeps the clay from drying out, but I’d use it within a few days. Another issue I had to personally look into to help my breakouts was digestive issues. This is a great podcast that covers this topic a bit more: https://chriskresser.com/naturally-get-rid-of-acne-by-fixing-your-gut/. Hey Bree, I’m so glad you enjoyed the mask!! That’s so great to hear, Jenny! I’m excited for you!! I presume this would work just as well for back acne as well? Or would you change part of the recipe? Hey Susan, I believe so :). How long does this mask last for on the shelf?? 🙂 Looks so great, am going to try! Hey Kate, You could store it for about a week, maybe two. The clay may absorb the liquid over this time, so you may nee to hydrate it with more liquid (or just add a bit more in the beginning). There’s so many different ways to take out and remove toxins from our bodies. This is wonderful reminder of a cheap, effective means of getting the job accomplished. Acne can be a sign of various internal problems, especially when it exists outside the acne prone teenage year. Thank you for this solution. Hey Kerry, About 10-15 minutes, until dry :).